Acrobat Pro is included with CS4 Design Standard, Design Premium and Web Premium. 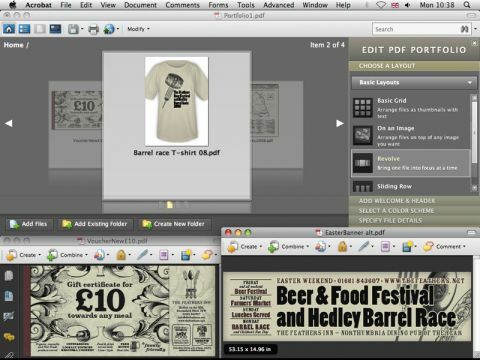 Its job is to create, edit and share PDFs originating from the other CS4 apps or from scratch. PDF is obviously becoming an increasingly flexible format. Differing from its CS4 companions, Acrobat keeps its own user interface. A new Multimedia menu houses the Flash Tool, which lets you add Flash files to any PDF; Flash playback is built into both Acrobat 9 Pro and the free Acrobat 9 Reader. You can also import other multimedia files, such as MOV video, which are automatically converted. A PDF can bring different kinds of document into one, but if you just want to deliver separate documents tidily, the new PDF Portfolio feature can help. Your recipient will access the files from a self-running Flash-based browser, for which various templates are supplied. For example, Revolve looks a bit like Apple's Cover Flow. The results look more professional than emailing a zip file. A new Collaborate menu goes further than the Share My Screen option elsewhere in CS4, using Adobe's www.acrobat.com to let you upload files for other users, allowing you to access a file at the same time as a remote colleague, turning pages and zooming to show each other items. If you use Acrobat to check and tweak InDesign output on the way to press, there are several useful enhancements in this version. Overprint Preview is now smarter and integrated into Output Preview, which also gains an Object Inspector that tells you all about any page item, including the effective resolution of an image. Acrobat also has an Extended edition aimed at business and technical users and, like the cut-down Standard edition, is only available for Windows. For those who need Pro, version 9 is a significant upgrade.